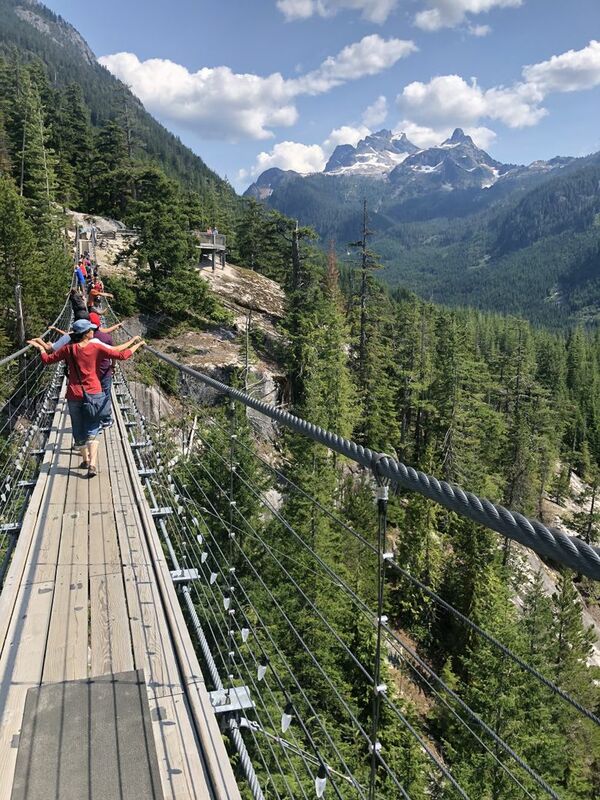 I spent years traveling to Canada without ever making a conscious effort to visit one of British Columbia’s publicly maintained outdoor recreation areas known as provincial parks. 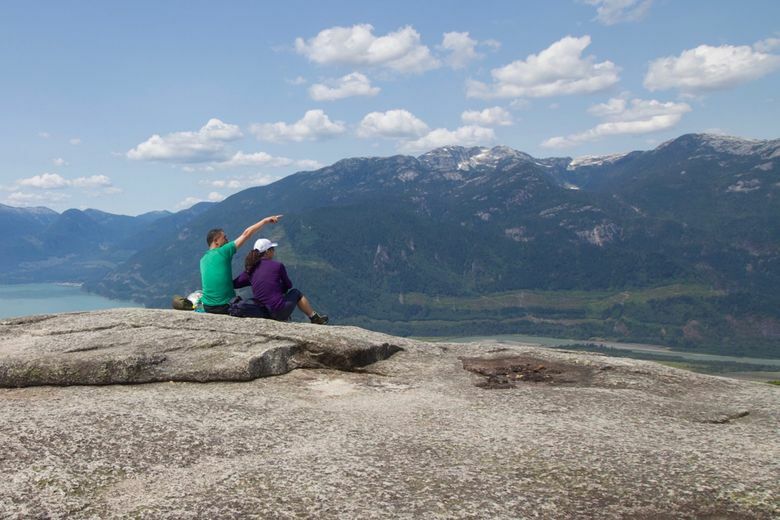 When I started seeking them out, I discovered that it’s hard to beat the offerings at Squamish, surrounded as it is by six hike-filled provincial parks as well as other activities of all kinds. I’m late to this party. 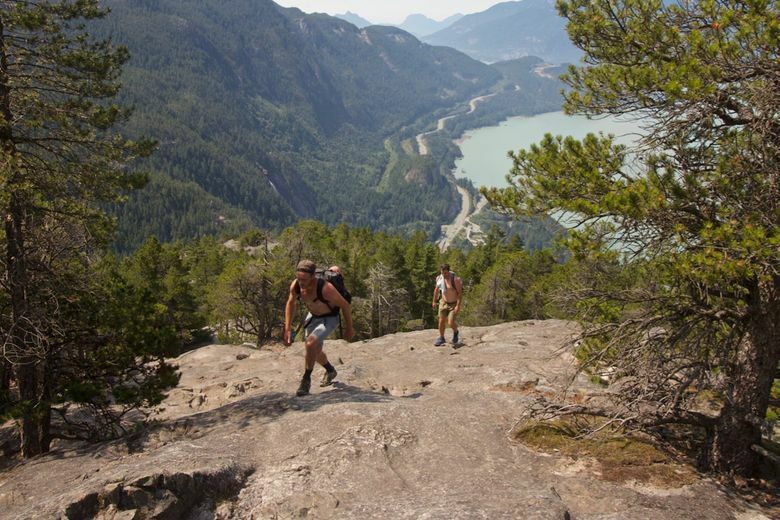 After decades as an under-the-radar hub for climbing bums drawn to its endless cliffs, Squamish has seen an influx of both tourists and commuters willing to make the 45-minute drive to Vancouver in exchange for having such recreational bounty in their backyard. Here are some of the area’s highlights for hikers and climbers. I visited Squamish partly to hike up Stawamus Chief, locally referred as “the Chief,” which lies in its own provincial park. It’s the big granite monolith that rises right next to the highway. It’s easy to see why its vertical sides appeal to climbers, but the draw for hikers is less clear — one wonders how they even reach the top. But they do, and so did my husband, Bill, and I on a hot day in July. The Chief is shaped a bit like a loaf of bread, with three main peaks. The hike to First Peak is a mere 1.2 miles each way. But in that distance, the route gains 1,500 feet, and I felt every one of them. Second Peak adds another .3 miles, including a fair bit of scrambling. Third Peak adds another .6 miles, for a round-trip total of roughly 4.3 miles. 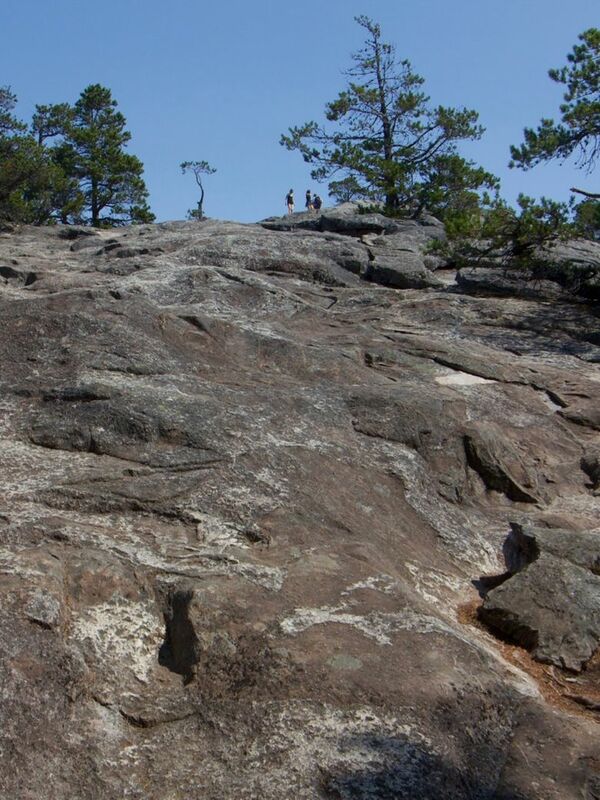 Near the top, chains bolted into the steep, exposed granite help you scramble to the summit. 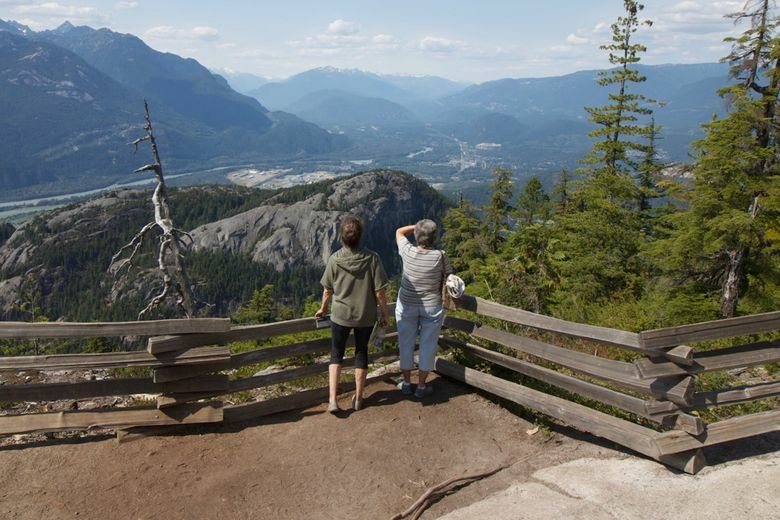 The views are stunning, partly because of how far you can see out over Howe Sound and the surrounding mountains, but also because of the steep drop-off on three sides. Across a deep chasm, you can see hikers making the final ascent on an adjacent peak. 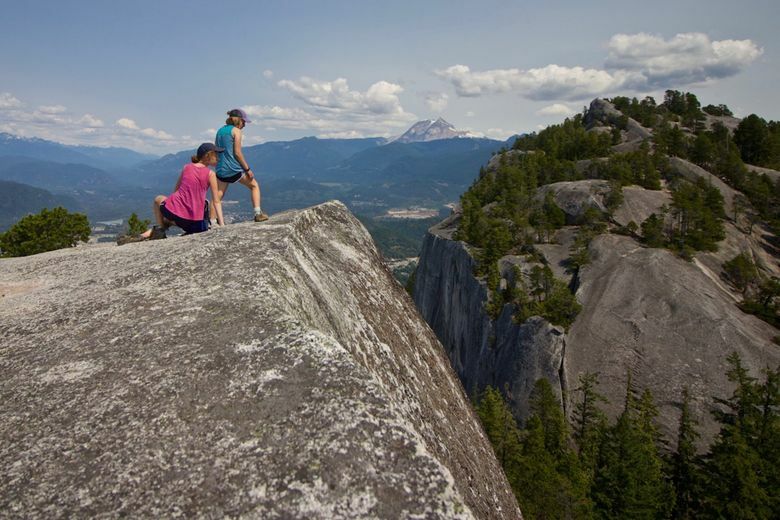 Stawamus Chief Provincial Park makes achieving your goal as painless as possible. Almost the entire hike is on carefully designed, well-constructed stairs, which I’ll take any day over a steep slope that leaves me feeling as if my toes are about to touch my shins. Bathrooms at the bottom are clean, especially considering the volume of hikers and climbers who use them. (Climbers also fill the park’s flat, shady campground.) Did I mention entry is free? Thank you, Canadian taxpayers! Bring snacks, and a lot more water than you normally would for a short hike (you will sweat, copiously). Feeling accomplished, we tried another ascent: the Sea to Sky Gondola, which carries visitors up a taller neighboring mountain. More ambitious folks can hike the Sea to Summit Trail to the top, grab a bite and a beer, and take the gondola back down. The 4.6-mile ascent gains about 3,000 feet, with a couple of extra-steep scrambles and a fixed-rope climb. You can also hike directly to this trail from the Chief. We took the easy way up, had lunch, and then wandered a few miles along well-maintained, mostly level trails to viewpoints with even more expansive views than those from the top of the Chief. Viewpoints look across foothills and valleys toward some of the area’s most famous peaks, including Garibaldi (which stars in its own provincial park) and Sky Pilot. You could easily spend a whole day hiking up here, especially if you go for the 5.2-mile round-trip Al’s Habrich Trail, which leads uphill into the forest and to a lake. There’s also a via ferrata, a guided adventure using ropes and ladders to cross the face of a cliff (it costs extra). It’s not too scary, and most kids should be able to do it. 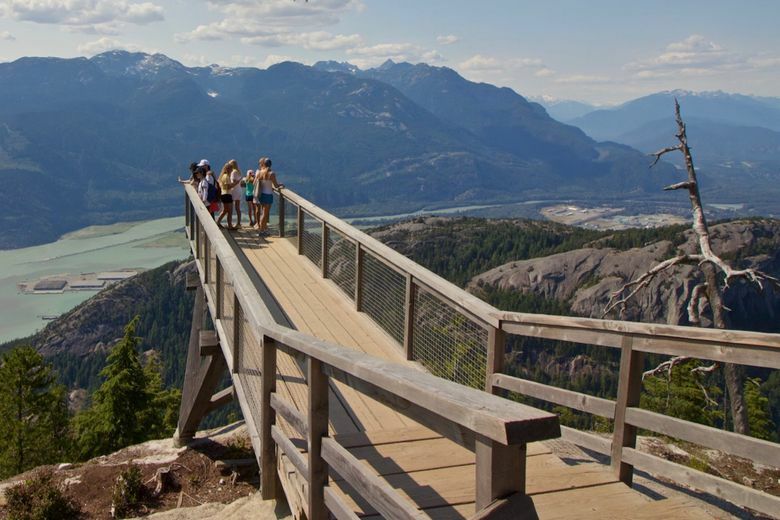 Be sure you stop at nearby Shannon Falls Provincial Park. Right off the highway, the gorgeous falls drop about 1,100 feet. If you’re already parked in the gondola lot, you can get there on foot via a short connector trail (ask at the base if you can’t spot the trailhead). 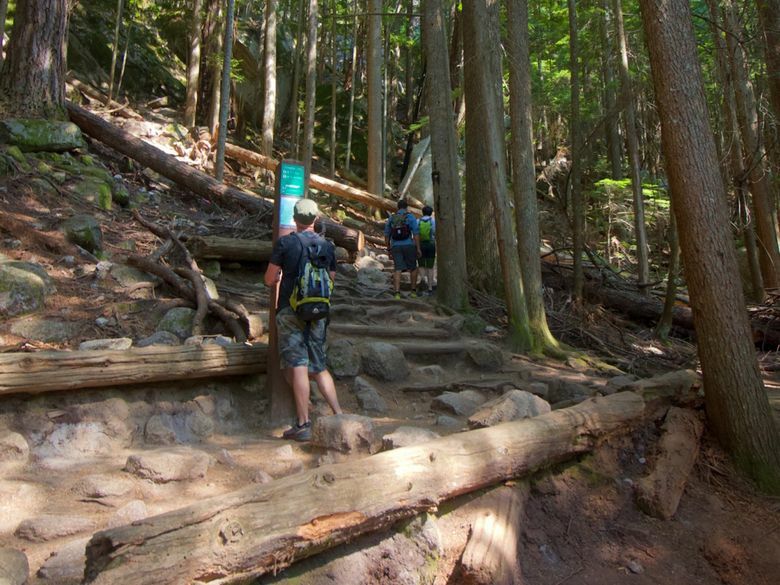 The other provincial and local parks nearby offer even more options, many of them less steep. Everywhere we went, trails were well blazed with markers attached to trees. North of town, Alice Lake Provincial Park, home to four swimmable lakes, is a favorite for local families and out-of-town campers. Garibaldi Provincial Park is the place to go for longer hikes as well as overnight backpacking. And at Brohm Lake Interpretive Forest, we hiked undulating shaded trails around the namesake lake, one of the area’s warmest, a prime spot for cooling off on a hot day. This is bear country. They’ve been spotted in campgrounds, and we even saw one wandering a meadow outside our hotel. Be careful with food and trash. Provincial parks are usually free to enter, but camping and backcountry permit fees may apply. Check the B.C. Parks website (www.env.gov.bc.ca/bcparks) in advance to see if the park you’re visiting takes reservations, which are recommended. Many backcountry areas require permits for camping.